CALLS have been made to honour an Irish diplomat who took on Adolf Hitler. 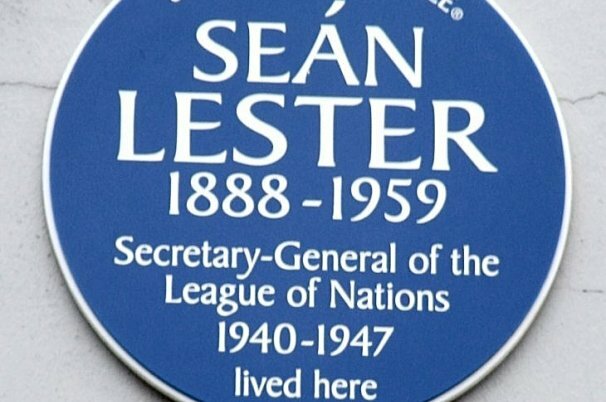 The work of Sean Lester, who was the last secretary general of the League of Nations, has been overlooked and his contribution to history has been forgotten, according to historian and author Dr Paul McNamara. Lester opposed Nazi attempts to limit freedom of speech and criticised moves by Hitler to silence his political opponents. By doing so he incurred the wrath of the dictator, who called for Mr Lester to be removed by the League of Nations. Speaking in a BBC Radio Ulster documentary, A League of His Own, Dr McNamara said the Co. Antrim diplomat has been ignored and Carrickfergus-born diplomat who opposed the Nazis in the 1930s should be honoured. Dr McNamara said he would like to see a street named after the diplomat or a postage stamp created to mark Sean Lester’s life. “We have a tendency to celebrate some pretty tenuous links with some great events, and here we have a person who’s in the cockpit of diplomacy in one of the big trouble spots of Europe in the 1930s,” he said. Mr Lester’s only surviving daughter, Patricia Kilroy,was with her father in Danzig in the 1930. She said the family telephone was bugged, their letters were read and visitors to the building were photographed and often followed. “Anybody anti-Nazi had a difficult time,” she said.